WAR OF THE REALMS TIE-IN! • You know how Squirrel Girl has stayed out of most Marvel events? Turns out, that was only because THOSE events didn't involve her good pal LOKI LAUFEYSON! 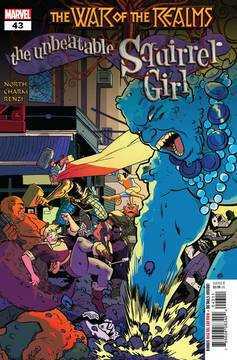 • When Earth is attacked as part of the WAR OF THE REALMS, Squirrel Girl is called back from her Negative Zone vacation, and Loki recruits her as part of a secret mission! • Is Loki running a scheme? Probably. Is he playing a trick? Almost certainly. But he NEVER lies about the safety of his good friend (and Cat Thor creator) Nancy Whitehead, and that puts him and Doreen on the same side. • It's Squirrel Girl's first BIG EVENT CROSSOVER... but it's still the start of a stand-alone epic that you can still enjoy even if you only read SQUIRREL GIRL! • Also if you're reading this because you're thinking, 'Hmm I'm big into WAR OF THE REALMS but do I really need to see what happens in SQUIRREL GIRL' then let me say WOW DO YOU EVER, THERE'S A REVEAL ON THIS LAST PAGE THAT'S BEEN IN THE WORKS FOR YEARS! Rated T.